TAIPEI CITY -- The world governing body of baseball and softball, the WBSC, has announced that the world-famous PEANUTS comic strip icon, Snoopy, will be the official Global Ambassador of the U12 Baseball World Cup 2015, being staged from 24 July - 2 August in Tainan, Chinese Taipei. The announcement was made at Daan Forest Park in Taipei City, alongside Tainan Mayor Lai Ching-Te, Taiwan Ministry of Education Deputy Director of Sports Administration Peng Tai-Ling and Chinese Taipei Baseball Association (CTBA) Honorary President Tom Peng, and was followed by a U12 Baseball World Cup 'live' dance performance by the life-sized Snoopy and Charlie Brown. "Baseball and softball support the IOC's Agenda 2020 under President Thomas Bach, and the focus on youth and sport in society,” Fraccari said. "Snoopy is embraced by many different cultures and societies globally, and Snoopy's involvement and promotion of the U12 Baseball World Cup can help produce a synergy that we hope can connect more young people with sport and the lasting teachings of sport -- on and off the sports field." 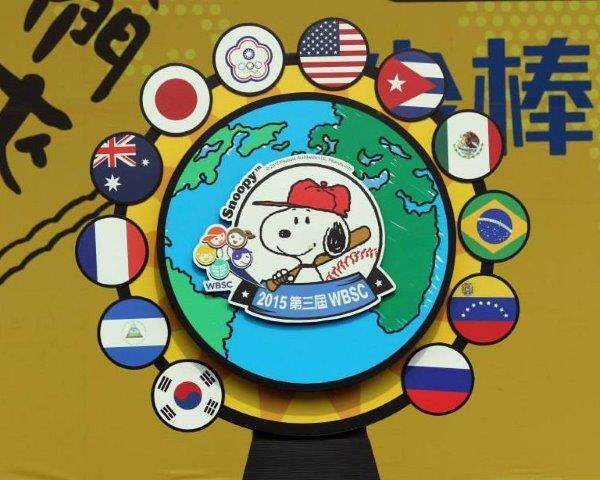 As part of his role as Global Ambassador of the WBSC U12 Baseball World Cup, Snoopy will be incorporated into the official look and logo of baseball's 2015 U12 world championship, which will showcase the elite 12-year-old baseball players in the world playing for their National Teams. Venues in Tainan, where the U12 World Cup will be hosted by the CTBA and City of Tainan through 2019, will have designated areas with signage featuring Snoopy and the rest of the PEANUTS Gang in iconic poses, playing baseball, for fans to visit and engage with as part of the attractions and to share selfies via social media from the 2015 WBSC U12 Baseball World Cup III. In addition, Snoopy, who was both a player and manager of the PEANUTS comic strip baseball team, will visit the venues during U12 World Cup competition to interact with fans and deliver an unforgettable in-stadium experience in Tainan. "Global events that attract and put the focus on the next generation of athletes and fans to grow our sport around the world is a top priority for the WBSC and all our sport's stakeholders, particularly as we strive to earn a place for baseball and softball in the Olympic Games," WBSC President Fraccari said. "Snoopy joining our team as the Global Ambassador for the 2015 U12 Baseball World Cup is in perfect alignment with the mission, values and objectives of the WBSC and our sport." The U12 Baseball World Cup, now in its third edition, is one of several junior baseball and softball world championships in the portfolio of events conducted by the WBSC, which is hoping for the possible inclusion of baseball and softball at the Tokyo 2020 Olympic Games.